What is arguably the most important car show in the ASEAN region is scheduled to open its doors on March 27 as Grand Prix International (GPI), together with the Thai Automotive Industry Association, stages the 34th Bangkok International Motor Show at the Impact Challenger Hall in the Muang Thong Thani complex in Bangkok, Thailand. This year's theme is "Street of Automotive Fashion," so we imagine that fashionable cars will make up a significant number of the vehicles on display. And since the Thai automotive market is huge, we won't be surprised if we see cars like the Mercedes-Benz CLA-Class or the BMW M6 Gran Coupe on display. Incidentally, the Bangkok Motor Show is being staged a week after the Geneva Motor Show, so there's a slim chance that we might get to see some of the cars displayed at the European motor show. If so, on our wish list would be the production-ready McLaren P1 and the Toyota FT-86 Open concept. "Automotive design is based on ergonomics, of keeping people comfortable," said GPI senior vice president Jaturont Komolmis. "Automotive design is fashionable, and this is what people look for. 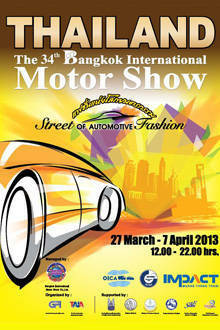 The Bangkok International Motor Show is the stage of the automotive fashion industry." Would EO 156 really halt the importation of secondhand cars?